Muslims in Nigeria are to be led by a traditional leader rather than Islamic extremists who are anti-education and economic opportunities of the nation's poor. An outspoken former central bank governor who advocates education and economic opportunities for Nigeria's majority poor has become a key religious and traditional leader of the country's Muslims, a counterpoint to Islamic extremists who aim to destroy the Western system of education and who have slaughtered and kidnapped students. Lamido Sanusi was appointed on Sunday as the new emir of Kano, replacing Emir Ado Bayero who died at age 83 and who had survived an assassination attempt by the Islamic militants in January 2013. 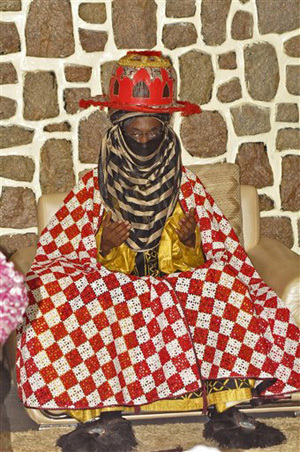 On Tuesday, the white-robed Sanusi received royal swords and traditional insignia in a palace to mark his ascendancy, according to a local media report. Boko Haram, the Islamic insurgent group, sees northern traditional religious leaders as false Muslims who don't fully implement Islamic law. For their part, the traditional monarchs have declared Boko Haram's violent activities as being non-Islamic. As a central bank governor, Sanusi spoke out against corruption and for gender equality, girls' education and women's access to finance. He criticized Nigeria's high illiteracy rate and lack of opportunity, particularly in the Muslim north which is much less developed than the south, where the commercial center of Lagos lays. But Boko Haram, which gained worldwide notoriety when it kidnapped hundreds of school girls on April 15, says Western influences and education have created corruption that enriches a few while most people in this oil-rich nation remain impoverished, and says the only solution is to follow its strict form of Islamic law. Few pupils and teachers are willing to attend school amid attacks by Boko Haram on schools in its home turf in Nigeria's northeast, said Obong Obong, the secretary general of the Nigeria Union of Teachers. While the 52-year-old Sanusi won't be able to make government policy, as the second-most influential traditional and Islamic monarch in northern Nigeria he will influence Muslims, who comprise roughly half of Nigeria's population of more than 170 million and who mostly live in the north. The Sultan of Sokoto is seen as the top spiritual leader of Nigeria's Muslims. Christians largely populate the southern, and more prosperous, half of Africa's most populous country. Sanusi "is very interested in girls' education and I'm sure he's going to try to bring his influence to promote girl child education and equality of women in general," said Jibrin Ibrahim, a fellow at the Center for Democracy and Development in Abuja, Nigeria's capital. It will be a difficult task. Even before Boko Haram started its attacks five years ago, education levels were already low in the north, with 60 percent of northern women being illiterate compared with 29 percent in the south, according to the national statistics bureau. In a July 2012 speech as central bank governor, Sanusi lamented traditions that stand in the way of women's equality. "Women face peculiar exclusion as a result of cultural, religious and social biases that hinder their access to financial services," Sanusi said in the speech, according to the central bank's website. "It will be pertinent to explore the possibility of enacting laws that address gender inequality, sexual harassment and discrimination." The current Nigerian constitution doesn't specify the role of traditional monarchs, whose legal powers and independence ebbed under British colonial rule and eroded further during military rule after Nigeria became independent in 1960. Still, they gain "influence from history, influence from tradition where people are loyal to them. They get influence from their connection to the governor and politicians," said Toyin Falola, a Nigerian who has written several history books on Nigeria and Africa and who teaches at the University of Texas. Sanusi has a history of outspokenness. As an emir, he's expected to remain outspoken on social and religious issues. He may also subtly use his influence to sway public opinion before the general elections in February next year though he will avoid being linked to any political group, said Falola. As central bank governor, he was a staunchly anti-corruption and fired eight executive officers of banks within four months of assuming his post in June 2009 for reckless lending. He pushed for more women to hold management positions in banking and for small-business loans to be earmarked for women. But after Sanusi began providing evidence to a parliamentary committee on billions of dollars that he said the state oil company failed to remit to government coffers, President Goodluck Jonathan suspended him in February on accusations of "financial recklessness," keeping him out of office till his term ended on June 2. In Nigeria's February 2015 elections, Sanusi - who isn't a declared member of any political party - will probably even subtly influence how people vote in Kano, Nigeria's second-biggest city, and surrounding areas, said Falola.